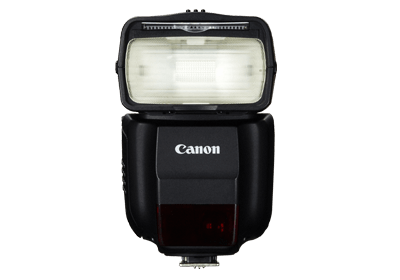 With a flash effective range of guide number 43 (m/ISO 100), this speedlite also features a compact size, built- in catchlight panel, a dot-matrix LCD rear panel, and a wheel-type select dial for enhanced operability. With the bundled bounce adapter and colour filter, an even richer range of expression is possible. The settable bounce angle has coverage of up to 180° right and up to 150° left, providing it with increased flexibility. Can function as a slave device during wireless flash photography through optical transmission within a transmission distance of approximately 15m.